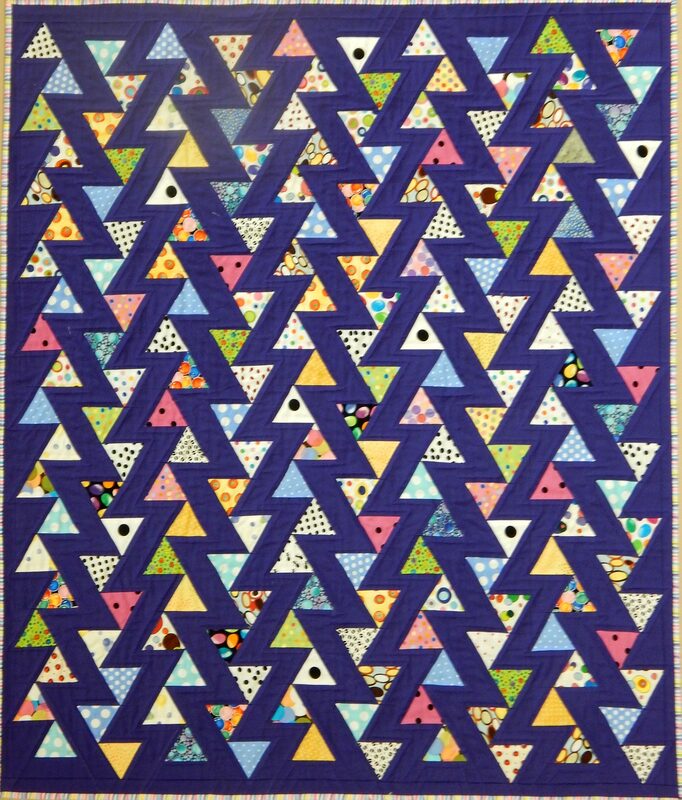 I cut the triangles from my 3-1/2 inch scraps, and had almost enough scraps to cut all 200 triangles–very little yardage was used up for this part of the process. 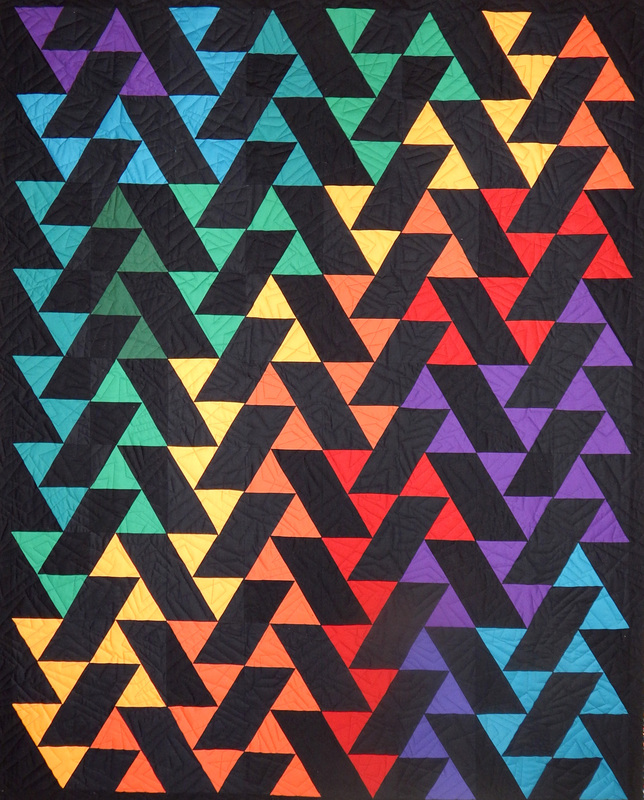 After over a year of dawdling, I have finished my quilt from the beautiful Lombard Street pattern by Sassafras Lane Designs. 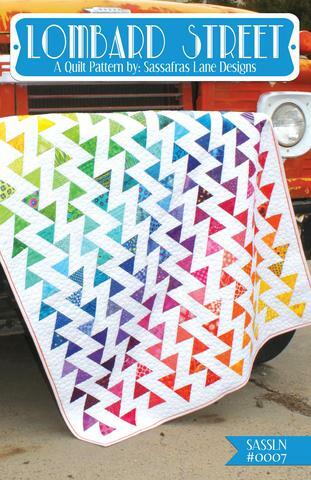 I rarely use patterns, since I prefer to design my own quilts, but this one caught my eye! 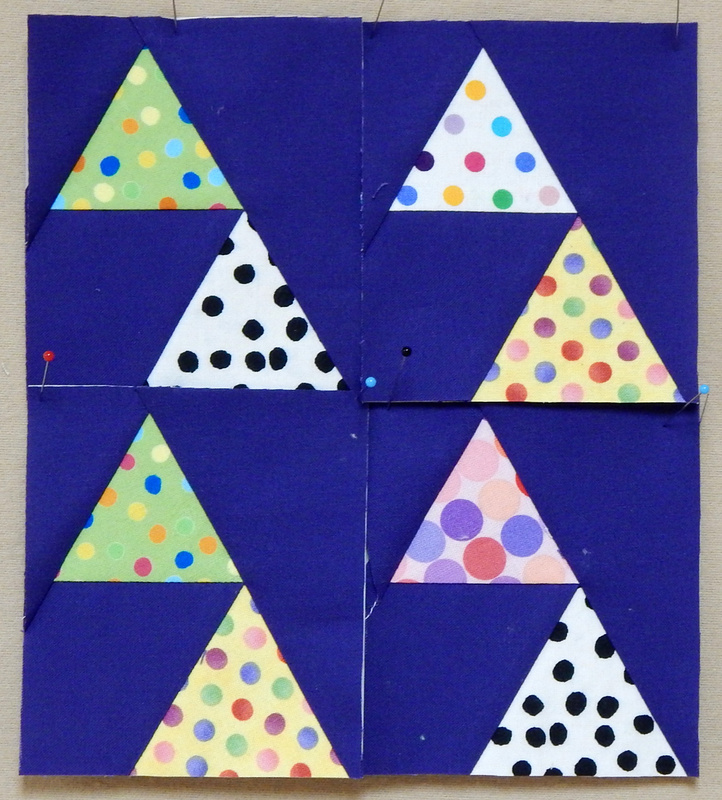 The “trick” is that it is paper pieced, which helps all those points come out nice and sharp. The pattern is well written and the instructions are clear. I had no trouble from that quarter. 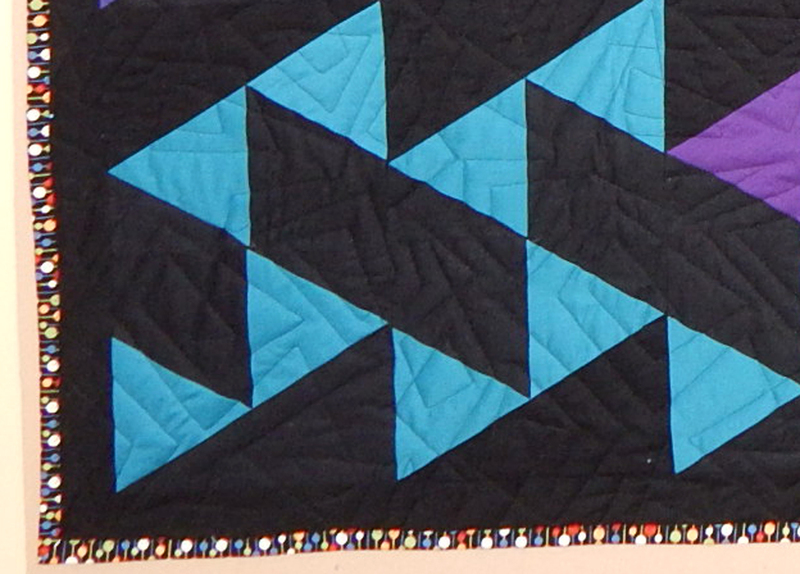 And look at that nice angular quilt pattern that reinforces the overall design! I haven’t made any of the other patterns from Sassafras Lane, but I was very satisfied with this one, and they certainly have some cheerful and interesting designs. 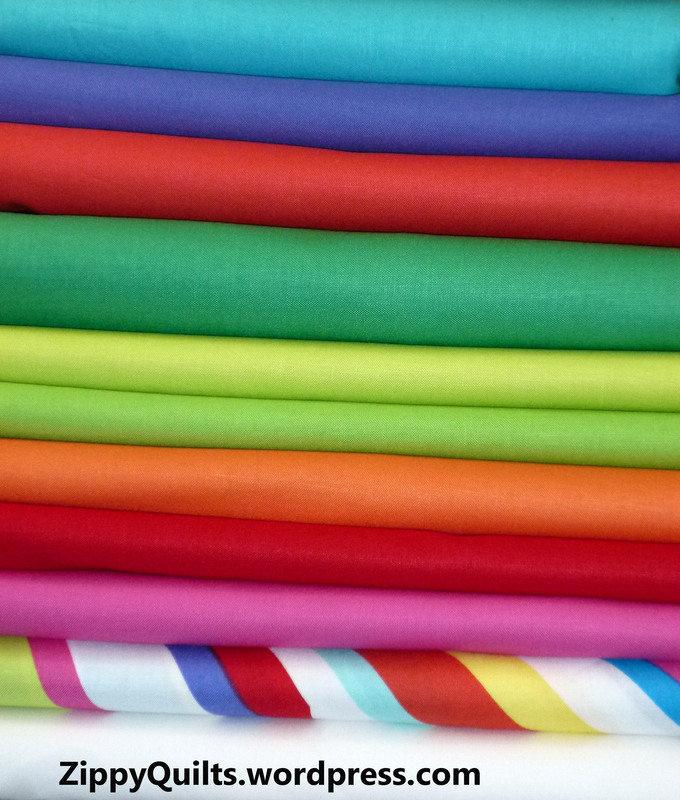 I do recommend checking them out if you like cute modern patterns. 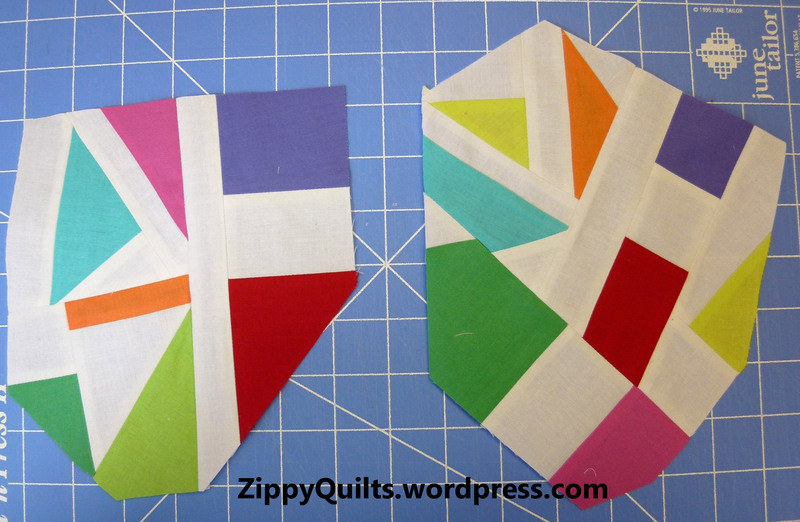 I’ll blog about that project when it’s published this summer, but for now I’ve made a confetti block from the scraps. 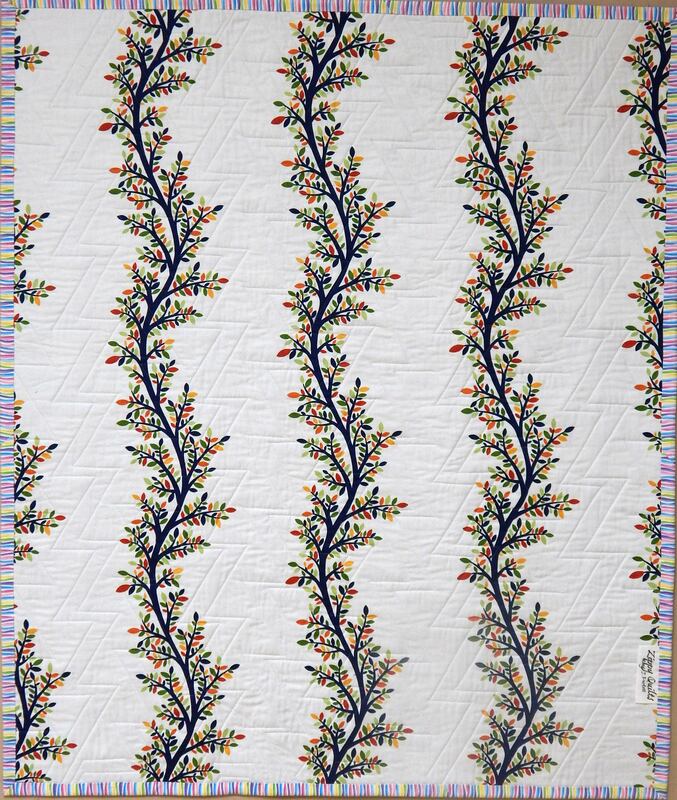 The Michael Miller Fabric Company (one of my favs) kindly supplied the fabric for this quilt from their Cotton Couture solids, plus a wonderful print called “Tara’s Fireworks“. 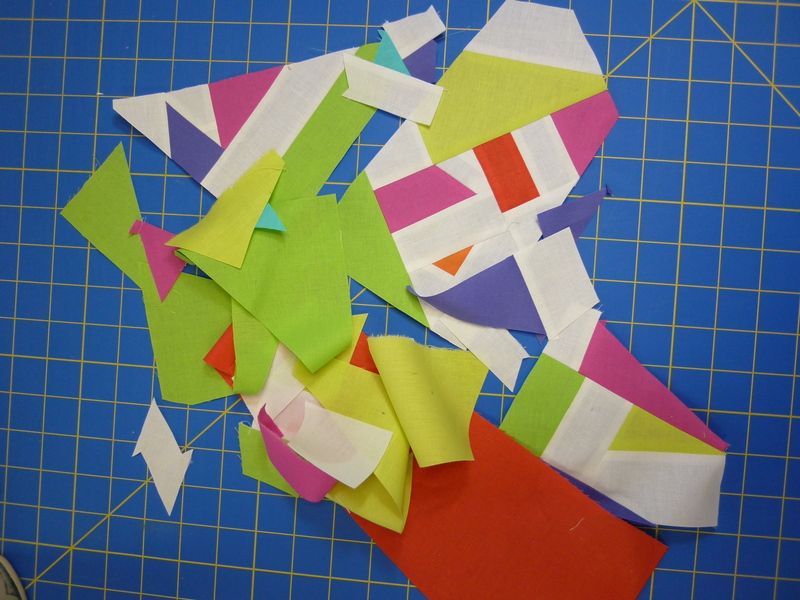 All those beautiful colors in little bitty pieces just FORCED me to make an improvisational block representing confetti! Eventually some bigger sections emerged. 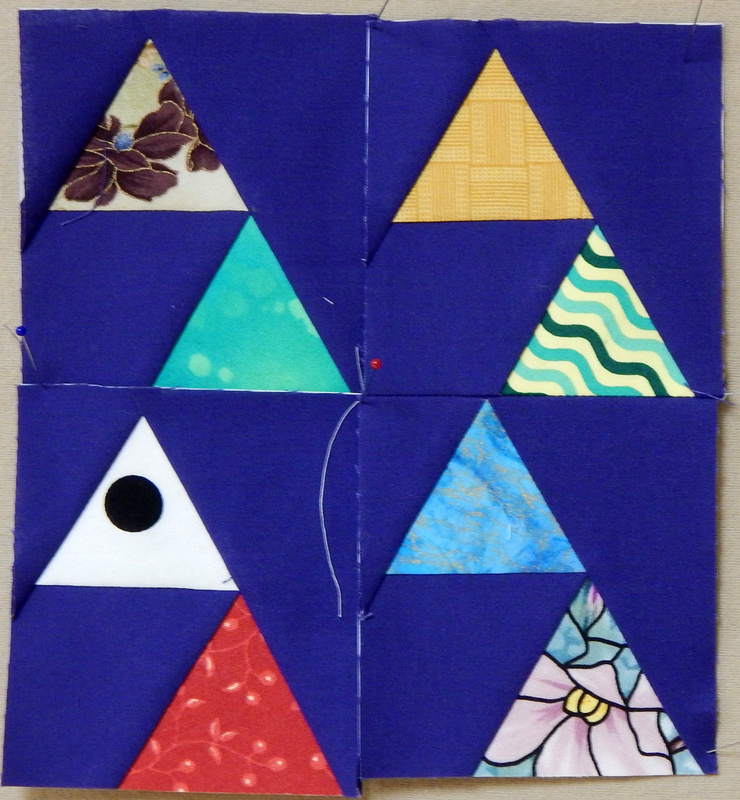 And finally, I had a piece just a bit larger than 12-1/2 x 12-1/2, which I’ll eventually trim to make a block. 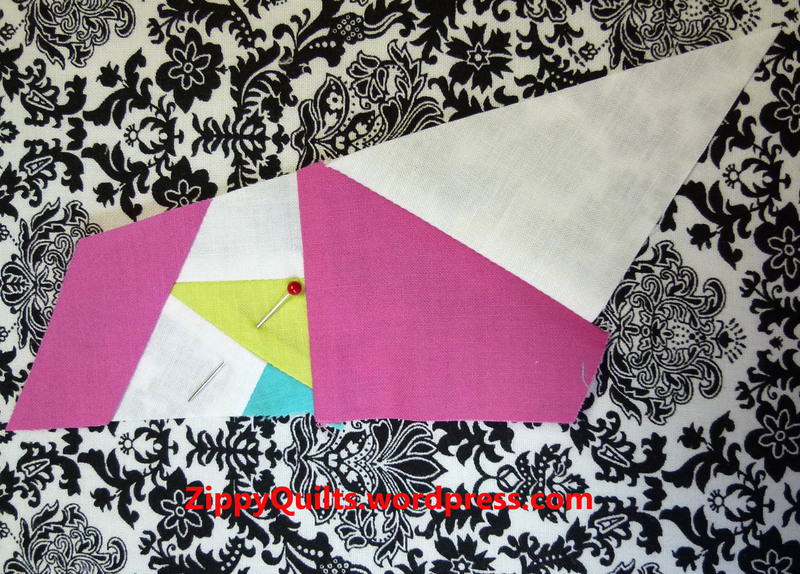 I can just hear someone saying, “so what is this block FOR?” Well, it’s FOR FUN! 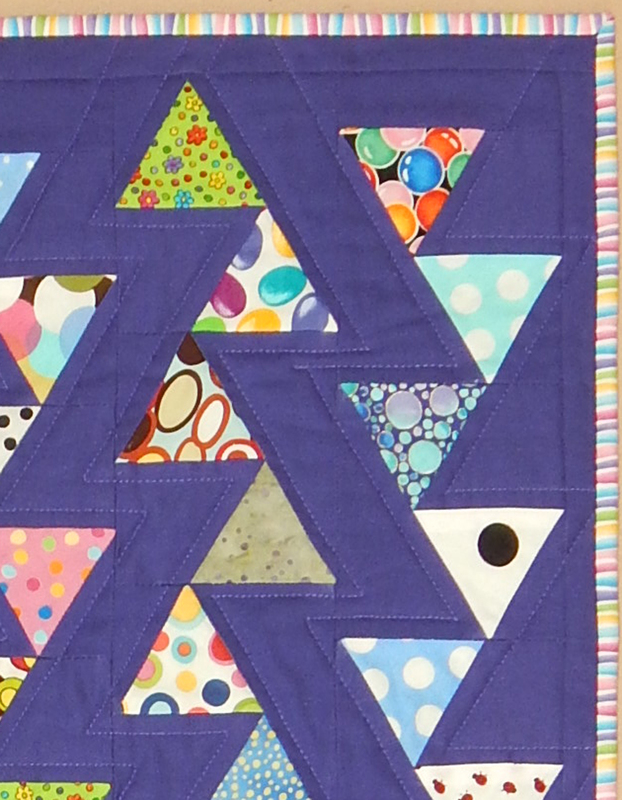 OK, I do have a plan for this block, but that’s a secret for now 😉 Meanwhile, that was great fun, so if you haven’t tried improvisational piecing yet, just go for it!